Peterlee is a small town in County Durham, England, founded in 1948, and built under the auspices of the New Towns Act 1946. It has economic and community ties with Sunderland, Hartlepool and Durham. The case for Peterlee was put forth in Farewell Squalor by Easington Rural District Council Surveyor C.W. Clarke, who also proposed that the town was named after the celebrated Durham miners' leader Peter Lee. 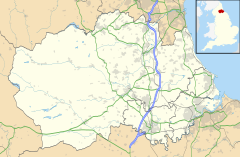 Peterlee is one of the few places in the British Isles to be directly named after an individual, and is unique among the new towns which came into being after the Second World War, in that it was the only new town requested by the people through their MP. A deputation, mostly if not all working miners, met with the Minister of Town and Country Planning after the Second World War to put the case for a new town in the district. The Minister, Lewis Silkin, responded by offering a half-size new town of 30,000 residents. The subsequent new residents came largely from the surrounding villages in the District of Easington. The Peterlee Development Corporation was established in 1948, first under the direction of A V Williams, then under Dr. Monica Felton. The original master-plan for towering blocks of flats by Berthold Lubetkin was rejected as unsuitable for the geology of the area, which had been weakened by mining works, and he resigned in 1950. George Grenfell Baines replaced Lubetkin and began to build quickly, resulting in buildings of poor-quality construction. Williams invited an artist Victor Pasmore to be head of the design team for the landscaping. The Apollo Pavilion, designed by Victor Pasmore, was completed in 1970. It provided a focal point for the Sunny Blunts estate as well as a bridge across a water-course. It was named after the Apollo moon missions. From the late 1970s, the Pavilion became a target for vandals and anti-social behaviour. Original murals on the building faded, and to discourage anti-social behaviour, staircases were removed in the 1980s. In 1996, there was a failed attempt to list the Pavilion. English Heritage described it as "an internationally important masterpiece". However, some local residents and councillors saw Pavilion as an eyesore and campaigned to have it demolished. The campaign appeared to have been successful when demolition was proposed in 2000. However, in July 2009, a six-month revamp programme was completed at a cost of £400,000. As part of this, original features such as the murals and stairs were reinstated. In December 2011, English Heritage gave the pavilion a Grade-II* listing. Peterlee is served by two main roads, The A19 runs to the west of the town leading to Sunderland in the north and Teesside in the south, the A1086 runs to the east of the town leading to Easington in the north and Hartlepool to the south. The B1320 runs through the town centre linking the town to Horden and the A1086 in the east and Shotton Colliery and the A19 in the west. The B1432 to the north from the town centre leads to Easington Village, Hawthorn and Seaham on the route of the old A19. The A181 runs to the south west of the town at the Castle Eden and Wingate junction on the A19 leading to Wheatley Hill, Thornley, and Durham. In 2008 the A688 road was extended to the A181 at Running Waters from the A1(M) junction at Bowburn. This created a new trunk road from Peterlee to the A1(M) via the A19, A181 and A688. Peterlee is served by Arriva North East and Go North East, which provide services in the local area, to Dalton Park, and to the towns and cities of Newcastle, Gateshead, Sunderland, Houghton-le-Spring, Durham, Hartlepool, Sedgefield, Newton Aycliffe, Billingham, Stockton, Middlesbrough and Darlington. Peterlee was served by Horden railway station on the Durham Coast Line until it closed in 1964. However, in 2017, Durham County Council announced that a new station for Horden will be built after a successful bid for funding. Castle Eden Dene most of it within the boundaries of Peterlee, is a national nature reserve. ^ "Town population 2011". Retrieved 19 July 2015. ^ David Kynaston (2008). Austerity Britain 1945–51. Bloomsbury. p. 159. ISBN 978-0-7475-9923-4. Wikimedia Commons has media related to Peterlee. This page was last edited on 9 April 2019, at 20:52 (UTC).